Ask the Muscle Prof: Caloric restriction may be unavoidable if you're trying to lose weight, but that doesn't mean crash dieting is the only way. Use the latest research to your advantage and get lean the healthy way! How long should I diet when losing weight for a contest or event? Also, how do I deal with being so freaking hungry all the time? In America we want things instantly. So why wouldn&apos;t we all want to get instantly shredded? This mentality has led bodybuilders to go on drastic, unsustainable diets in order to rapidly lose fat. But is this the ideal method to lose fat? The knee-jerk response you&apos;ll hear from many people is "no," but the real answer is more complex. Cutting is never going to be fun, but it doesn&apos;t have to be sheer misery. Let&apos;s look at a few ways researchers have helped shed light on how we can improve this often misunderstood process. Let&apos;s address your appetite first, because, let&apos;s face it, nothing feels like a higher priority than hunger when you&apos;re under its influence. Luckily, there are a number of ways this situation can be controlled to some degree. One is to tap into your stomach&apos;s ability to sense the volume of the food you consume. Studies show that you will feel full, and thus stop eating, once your gut senses a certain volume of food has been reached.2 Therefore, your diet should be based on low-calorie, energy-rich, high-fiber foods like vegetables and lean protein sources, all of which will keep you feeling fuller for longer. You should also seek to add volume to your foods through the addition of air—by drinking blended smoothies, for example—and keeping your water intake high. Research has also shown that as individuals increase the variety in their diet, they&apos;re also more prone to eating spontaneously. This doesn&apos;t mean that you need to eat the same thing at every meal. However, when your primary goal is cutting fat, too much variety can chip away at your self-control.3 This—more than other times—is when you should focus on the essentials. Some muscle loss is inevitable when you&apos;re preparing for something as extreme as a physique show. But there are definitely ways to minimize this catabolic breakdown, primarily by keeping close tabs on your protein intake. A study out of the Department of Food Science and Human Nutrition at the University of Illinois at Urbana found that the protein-to-carbs ratio played a key role in sparing muscle tissue during weight loss.4 Specifically, a carb-to-protein ratio of 3.5-to-1 (68 g protein per day) led to similar weight loss, but far more muscle loss, than a ratio of 1.4 to 1 (125 g protein per day). To hold onto muscle, you need to eat enough of what muscle is made of! To address your initial question, time definitely has a lot to do with how you will lose weight and fat. You should understand on the front end that the amount of muscle you lose along the way will be related to how lean you are when dieting, and how rapidly you lose weight. Simply put, when you have a higher body fat percentage, you preferentially burn fat as fuel; if you&apos;re lean, your body will preferentially burn muscle if the calorie deficit is too drastic. Specifically, a study from the University of Rochester found that people with more fat could cut their calories by greater than 1,000 per day with minimal muscle loss, while leaner people lost the majority of weight from muscle at this level of deficit.6 However, the same study found that a lower calorie deficit, of less than 500 calories, resulted in minimal fat loss for lean individuals. This suggests that if you have a lot of body fat, you can cut calories more aggressively early in your prep, and become more conservative as you lean out. This approach was recently supported by a study in Norway, where athletes were placed on a weight loss program resulting in either 1 or 2 pounds lost per week.7 The subjects in the fast weight loss group lost a small amount of muscle and about 20 percent of their fat mass. On the other hand, the slow group lost more than 30 percent of its fat mass and actually gained muscle! 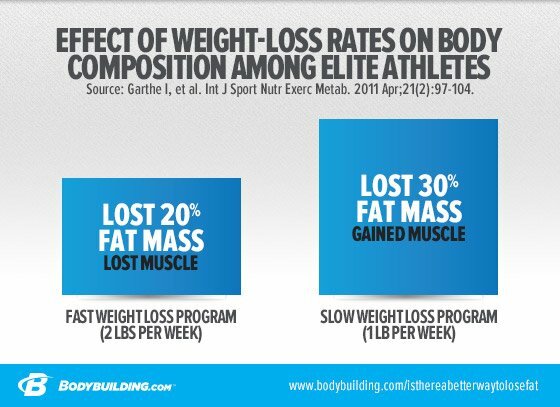 This indicates that a longer contest prep is more optimal for body composition than a drastic and short one. Anyone who has ever entered a physique competition has seen examples of how not to cut. Let&apos;s learn from this example! If only everyone were more balanced in their approach, they would look better—and just as importantly, feel better—as the big date drew near. Here are your rules for less miserable, more effective weight loss. Maintain a relatively equal balance of carbohydrates and protein sources, while increasing your intake of green vegetables. Approximately one-third of your plate should consist of protein, one-third starchy carbohydrates for energy, and one-third vegetables for bulk and volume. Consume a relatively moderate variety of foods. Don&apos;t get bored, but don&apos;t get too wild, either. Consider dividing your cut into two phases. If you start out lean—like 10-12 percent—consider losing just 1 pound per week throughout the first half of the cut and 0.5 pounds per week thereafter. If you start out with higher body fat of 15 percent or higher, you can start the diet a bit more aggressively, like 1-2 pounds per week, and then slow the rate of weight loss as you approach 10 percent. Maclean PS, et al. Biology&apos;s response to dieting: the impetus for weight regain. Am J Physiol Regul Integr Comp Physiol. 2011 Sep;301(3):R581-600. Kral TV, Rolls BJ. Energy density and portion size: their independent and combined effects on energy intake. Physiol Behav. 2004 Aug;82(1):131-8. McCrory MA, et al. Dietary variety within food groups: association with energy intake and body fatness in men and women. Am J Clin Nutr. 1999 Mar;69(3):440-7. Layman DK, et al. A reduced ratio of dietary carbohydrate to protein improves body composition and blood lipid profiles during weight loss in adult women. J Nutr. 2003 Feb;133(2):411-7. Loenneke JP, Wilson JM, Manninen AH, Wray ME, Barnes JT, Pujol TJ. Quality protein intake is inversely related with abdominal fat. Nutr Metab (Lond). 2012 Jan 27;9(1):5. Forbes GB. Body fat content influences the body composition response to nutrition and exercise. Ann N Y Acad Sci. 2000 May;904:359-65. Garthe I, et al. Effect of two different weight-loss rates on body composition and strength and power-related performance in elite athletes. Int J Sport Nutr Exerc Metab. 2011 Apr;21(2):97-104.